If your idea of a holiday includes getting out and about, then this is the place for you! From leisurely strolls to long-distance hikes, the area is a walker’s paradise. Local walking paths are signposted from most villages, with easy to follow colour-coded routes showing how far each walk is and how long it will take. One of the best nearby is the “Route des 15 Cazelles” which starts from the village of St Pierre Toirac just the other side of the river Lot. This 1.5 hour walk, offering spectacular views of the river valley through oak woodlands and along ancient dry stone walls, goes past 15 “cazelles” or stone shelters typical of the region. They come in all shapes and sizes, from tiny round shelters to substantial square two-storey structures, and each one has a unique charm. Count them off as you walk along! Click here for a map and detailed description of the route. Several national long-distance routes (the Grande Randonnée or GR routes) pass nearby, including the historical pilgrims’ route to Santiago de Compostella. 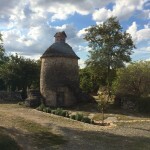 We can supply maps and guides for local walks, and tourist offices in nearby Villeneuve and Figeac have a wealth of information about walking in the area. Mountain bikers and road cyclists alike will love exploring this spectacular landscape. There are many kilometres of off-road routes covering the steep hillsides which provide plenty of challenges – including trying not to get too lost! 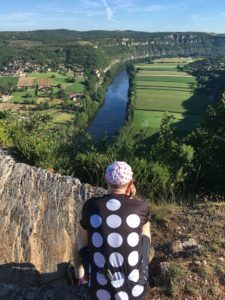 On the road you can choose to follow the river valleys or climb up and down between them, with spectacular views from the high limestone plateaus or “causses” to keep you going. Or for a more leisurely experience, enjoy the scenery from the water, kayaking along the Lot and the Célé rivers. Our favourite spot is the beautiful village of Marcilhac-sur-Célé where the friendly staff at Passion Aventure will organise anything between a 1.5 hour to a 3 day trip in a canoe or kayak. For more details check out their website here . And be sure to book a table for lunch at the Restaurant des Touristes where Mme Logé has been producing fantastic local food from her kitchen for years, while her daughter looks after you at the tables set up on the shady terrace. The friendy staff at Chez Valdine provide a warm welcome for children and adults alike. They organise pony and horse rides from 1 1/2 hours to full day excursions, including a picnic lunch and a dip in the river. They’re well used to complete beginners and made our rather nervous daughter feel comfortable very quickly. The stable is on a farm and the little ones will also love all the farm animals. Full details are on their website here. Monplaisir Holidays © 2019. All Rights Reserved.